My brother Tony bought this yesterday in Todmorden market. We’ve been trying to find out what it was used for. It’s the wrong shape and too uncomfortable for a shoe horn, although the shape suggests a similar use. It’s not in Eric Sloane’s Museum of Early American Tools and Google image searches have proved fruitless. It is iron, blacksmith-made with a little scroll on the end on the hook. The edges are not sharpened.It’s 7 1/2 inches long overall. After extensive searching through tool books, the nearest I’ve come is a similar item used for running molten lead into a stone socket when fixing e.g. upright iron railings. Not a shoe horn but a horn for riding boots? 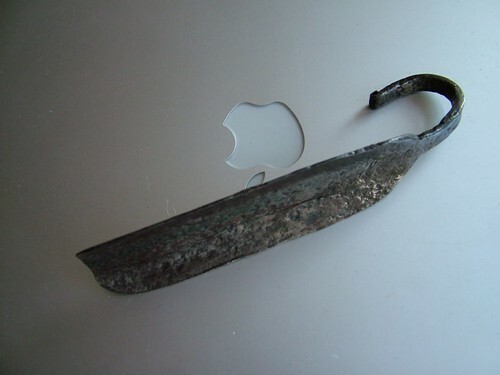 The shape of the tool is intriguing, and I wonder whether the curled portion was originally made that way? Further, I wonder if the material is tool steel, as opposed to mild steel or even wrought iron. (The pitting suggests steel.) Imagine for a moment that the curled portion were straight instead of curled; with the longitudinal curve of the thicker portion, the piece would look to me like a gouge. If the mystery tool’s construction is of high carbon (hardenable or tool) steel, this would support my hypothesis. High carbon steel is that containing 0.60 to 1.0% carbon, and may readily be determined by touching the tool against a spinning grind wheel. Observe the sparks created. If they are single point “shooting stars,” the material is not high carbon steel. If the sparks have multiple branches (forks, tails, or feathering), the material is likely high carbon steel.